If you have them, knowing how to clean polished concrete floors is important if you want to maintain them for years to come. If your are ever in Home Depot or any of the other big box stores, you may not have noticed, but you were walking on polished concrete. You may have seen the maintenance crew using a big scrubbing machine on the floor. This big machine looks like a large box with a squeegie attached to the end of it and is called an autoscrubber. Autoscrubbers makes cleaning larger square footage floors a breeze. If you don't have an autoscrubber, you still need to know how to clean concrete floors to preseve the polish look. Polished concrete is often marketed as a maintenance free floor, but buyer beware, cleaning your concrete floor is very important if you want the polished look to last. 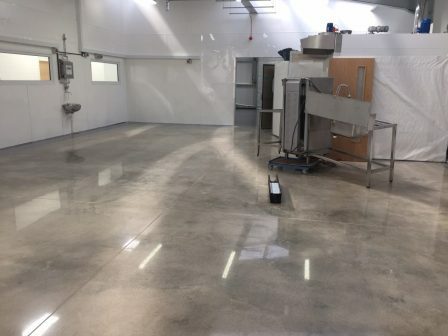 To learn more on how to maintain polished concrete, click the link maintenance of polished concrete floors. - Using a dust mop daily will greatly reduce the dirt, dust and whatever is on the concrete floor. It's the dirt and sand that get trapped in the pores of the concrete and when walked on, begin to erode and scratch, slowly dulling the beautiful reflection of the floor. - Using a wet mop or better yet, using a microfiber mop on your concrete floor weekly is highly recommended. If you have several microfiber mops we recommend using a clean mop every 300-400 square feet and if you're using a traditional mop, change the water regularly. The idea is not to be using dirty mops or dirty water throughout floor. In a commercial setting you may have access to an autoscrubber, which should be utilized. An autoscrubber is an awesome machine that makes cleaning your concrete floor a snap. - When mopping your concrete floor we recommend using clean water with a neutral floor cleaner. 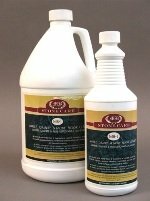 Using a neutral floor cleaner will clean with out damaging or deteriorating the polish finish. 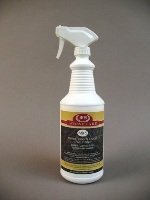 Using high alkaline cleaners like ammonia or degreasers on a regular basis can begin to diminish the polished finish over time. 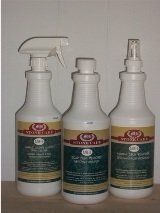 Never use an acidic cleaner such as vinegar. Acids can etch your concrete floor and will damage your polished concrete floor. - Although your polished concrete floor was most likely sealed, concrete is porous and can absorb liquids. We recommend cleaning any spill immediately. The longer a contaminate is on the floor, the more likely it can absorb into the concrete, possibly staining it. - Periodic buffing or burnishing of your polished concrete floor, will help preserve the reflective properties of your floor. How often this is done will depend on the traffic the floor gets. If it's a residential setting this may be every 2-3 years. 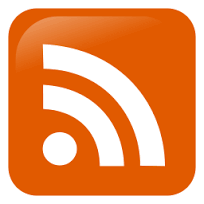 High traffic floors, like a retail store or restaurant could be monthly or quarterly. Knowing how to clean polished concrete floors is very important if you want to preserve the clarity and reflective properties of the floor. Ignoring or hoping it stays shiny and reflective is not going to work. As a concrete polishing contractor, I'm always disappointed when I see a neglected polished concrete floor. Following the tips I've outlined above will help tremendously in preserving the polished finish, avoiding more honing or grinding in the future, which could add more finacial burdens than necessary. 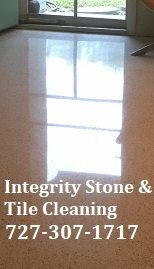 We offer our concrete polishing services in the entire State of Florida, but refinish terrazzo floors, clean tile and grout and natural stone surfaces throughout the Tampa Bay Area of Florida.